Welcome to the website of Glasgow Cathedral. We hope through this site to provide information about the congregation and history of the Cathedral. 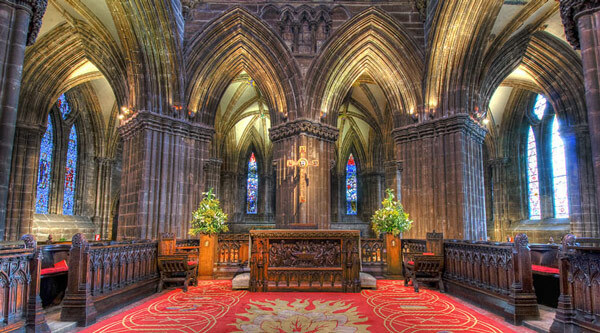 As an active Christian congregation of the Church of Scotland, within the Presbytery of Glasgow , the Cathedral always has a number of events running. We aim to publicise these and encourage your attendance and participation wherever possible. With a wealth of musical and vocal talent and ability, we are blessed with many fine recitals during the year. There are also Summer Music Recitals and a Winter Lecture Series. Details of these will be given as far in advance as possible. The wonderful architecture of the Cathedral speaks for itself and is to be enjoyed by anyone who visits it. Through this site we aim to give a flavour of Cathedral life, past, present and future. On the sidebar you will find a list of the different pages that you can navigate through to learn more about what’s on in the future or about the Cathedral’s past. To navigate back to the home page from any of the others, click on the ‘Glasgow Cathedral’ title on the top of every page. We do hope that you enjoy your visit to our site and that you will also be able to visit the Cathedral in person.